Transrotor Turntable Crescendo Blanco. Pure Elegance. True Audiophile. 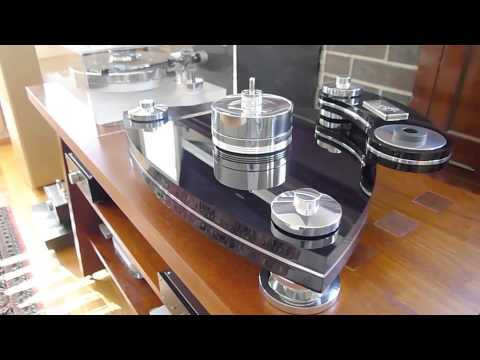 Transrotor Crescendo Blanco Turntable. Breathtaking. The Transrotor Crescendo Nero has absolutely amazing fit, finish and technology that far surpasses its price. It has Transrotor magnetic drive system which is a Transrotor original technology. Others are just coming out with copies of this superb technology. But copies are never as good as the original. This drive system began with Transrotor tables priced at $100,000. In corporating this into a table that cost $10,000 is amazing. The Transrotor Crescendo construction is all hand made and polished to the most exacting standards known. A revelation in design. No other table looks like it or sounds like it. The platter is huge with so much mass it needs a lot of muscle to put it on the precision bearings. The mass compensates for any resonate frequencies which are detrimental to tables. The motor is silent and extremely accurate. Tone arm and cartridge sold separately. Width 20.1" x Depth 15.4" x Height 8.7"